Decorate your nursery with this fun 3-piece set, which includes a quilt, bumper and fitted sheet. The bumper and multi-textured quilt are embroidered with adorable safari animals and match perfectly with the green dot fitted sheet. 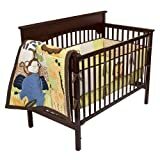 This crib set fits all standard cribs and is sure to add style and comfort to your child’s nursery. Copyright © 2015. DominionCreek.com All Rights Reserved.